FREMONT, Calif., Sept. 27, 2018 (GLOBE NEWSWIRE) — Aehr Test Systems (NASDAQ: AEHR), a worldwide supplier of semiconductor test and burn-in equipment, today announced that it has received a $2.7 million follow-on order from one of its lead FOX-XP Test and Burn-in System customers for a FOX-XP Multi-Wafer Test and Burn-in System and WaferPakTM Aligner to provide additional test capacity for the customer’s increasing silicon photonics device production requirements. The order includes down payments per Aehr Test’s standard terms and conditions of sale. The FOX-XP System and WaferPak Aligner are expected to ship in the next six months. Gayn Erickson, President and CEO of Aehr Test Systems, commented, “We are excited to receive this follow-on order for an additional full wafer test and burn-in system for silicon photonics devices. This customer is one of the world’s largest semiconductor manufacturers, and we are pleased to see their continuing ramp-up in production wafer-level burn-in capacity. With the increasing capacity of systems they are building up, we are expecting orders for a significant number of our proprietary WaferPak contactors to meet their production capacity, and we anticipate ongoing WaferPak needs with each new device change. In addition, this customer is forecasting capacity growth for silicon photonics devices that we expect to drive the need for additional production burn-in capacity for multiple years into the future. Aehr Test’s FOX-XP system is the company’s next-generation multi-wafer and singulated die/module test solution that is capable of functional test and burn-in/cycling of photonics devices, flash memories, microcontrollers, sensors, and other leading-edge ICs in wafer form before they are assembled into single or multi-die stacked packages. The FOX wafer-level systems utilize Aehr Test’s FOX WaferPak contactors, which provide cost effective solutions for making electrical contact with a full wafer or substrate in a multi-wafer environment. The new configuration with the DiePak® Carriers also enables burn-in of singulated die and multi-die modules to screen for defects in both the die and the module assembly process. The resulting known-good die or single-die or stacked-die packaged parts can then be used for high reliability and quality applications such as enterprise solid state drives, automotive devices, highly valuable mobile applications, and mission critical integrated circuits and sensors. The key features of the FOX-XP test cell that contribute to the cost-effectiveness of the solution include the ability to provide up to 2,048 “Universal Channels” per wafer or DiePak carrier, which allows the system to test all the devices on the wafer or DiePak carrier in parallel. The innovative “Universal Channel” architecture allows any channel to be any function (I/O, Device Power Supply (DPS) or Per-pin Precision Measurement Unit (PPMU)). This enhanced architecture now allows customers to perform per pin parametric testing, more extensive digital pattern test with deeper data stimulus / capture memory (32M per pin), and deeper scan (768M) optimized for BIST/DFT testing. 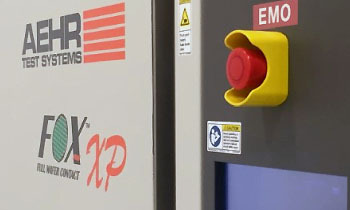 A single FOX-XP test system may be configured with up to 18 blades of wafer test resources, enabling up to 18 wafers to be tested simultaneously. The footprint of the 18-wafer test system is similar to the footprint of typical semiconductor Automatic Test Equipment (ATE) that can only test one wafer at a time. Headquartered in Fremont, California, Aehr Test Systems is a worldwide provider of test systems for burning-in and testing logic, optical and memory integrated circuits and has over 2,500 systems installed worldwide. Increased quality and reliability needs of the Automotive and Mobility integrated circuit markets are driving additional test requirements, incremental capacity needs, and new opportunities for Aehr Test products in package, wafer level, and singulated die/module level test. Aehr Test has developed and introduced several innovative products, including the ABTSTM and FOX-PTM families of test and burn-in systems and FOX WaferPakTM Aligner, FOX-XP WaferPak Contactor, FOX DiePak® Carrier and FOX DiePak Loader. The ABTS system is used in production and qualification testing of packaged parts for both lower power and higher power logic devices as well as all common types of memory devices. The FOX-XP system is a full wafer contact and singulated die/module test and burn-in system used for burn-in and functional test of complex devices, such as leading-edge memories, digital signal processors, microprocessors, microcontrollers, systems-on-a-chip, and integrated optical devices. The WaferPak contactor contains a unique full wafer probe card capable of testing wafers up to 300mm that enables IC manufacturers to perform test and burn-in of full wafers on Aehr Test FOX systems. The DiePak Carrier is a reusable, temporary package that enables IC manufacturers to perform cost-effective final test and burn-in of both bare die and modules. For more information, please visit Aehr Test Systems’ website at www.aehr.com. This press release contains certain forward-looking statements based on current expectations, forecasts and assumptions that involve risks and uncertainties. These statements are based on information available to Aehr Test as of the date hereof and actual results could differ materially from those stated or implied due to risks and uncertainties. Forward-looking statements include statements regarding Aehr Test’s expectations, beliefs, intentions or strategies regarding its products, including statements regarding future market opportunities and conditions, expected product shipment dates and customer orders or commitments. These risks and uncertainties include, without limitation, customer demand and acceptance of Aehr Test’s products, the ability of new products to meet customer needs or perform as described, as well as general market conditions and Aehr Test’s ability to execute on its business strategy. See Aehr Test’s recent 10-K, 10-Q and other reports from time to time filed with the Securities and Exchange Commission for a more detailed description of the risks facing Aehr Test’s business. Aehr Test disclaims any obligation to update information contained in any forward-looking statement to reflect events or circumstances occurring after the date of this press release.